Night School is a dim-witted, slapstick comedy that runs painfully long. Star Kevin Hart shifts his annoying antics into overdrive. He spends the film in a perpetual high-pitched squeal that grates the senses. Thankfully the supporting cast is filled with brilliant comedians. They level Hart's pestering with moments of scattered humor. Night School has an uplifting message, but it's delivered poorly. Director Malcolm D. Lee (The Best Man, Girls Trip) needed to rein in his lead and cut twenty minutes of runtime. Kevin Hart plays Teddy Walker, the top salesman at a store that sells barbecue grills. He drives a porsche, lives in a fancy duplex, and has a beautiful girlfriend, Lisa (Megalyn Echikunwoke). But it's all a facade. Teddy lives paycheck to paycheck, keeping up his successful image to impress Lisa and her high-brow friends. Everything comes crashing down after his disastrous marriage proposal. Teddy's forced to look for a new job, but is continually rejected. Teddy is a high school dropout. He decides to return to school and get his GED. Night School proves much more difficult than expected. The no-nonsense teacher (Tiffany Haddish), and his former rival turned school principal (Taran Killam), gasp, demand that Teddy does the schoolwork. Night School wears thin quickly. 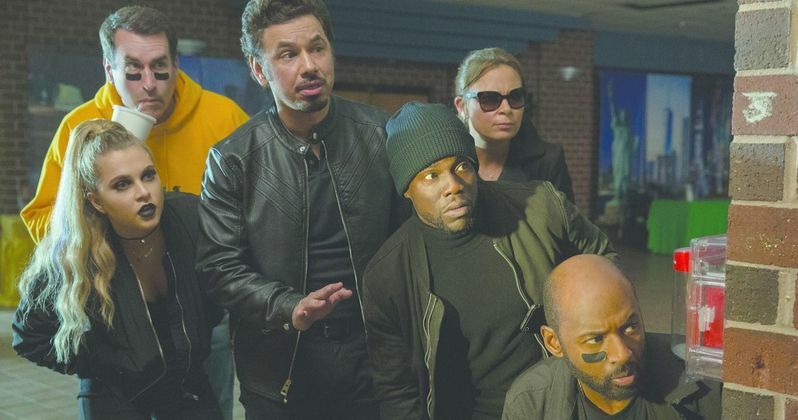 The script's entire purpose is to set up bumbling interactions for Kevin Hart. These scenes have Hart going overboard with his blaring, jittery spiel. They become tiresome in short order. Hart is a good comedic actor, but his success on screen comes in measured performances. He's a scene stealer in Central Intelligence and Jumanji: Welcome to the Jungle because of this approach. Night School has Hart unbridled and running wild. He produced the film, so it's his show to run. Hart needed a counterpart in the filmmaking process to provide a balancing critique. The supporting players save Night School from being a total loss. Tiffany Haddish, Rob Riggle, Romany Malco, and Mary Lynn Rajskub provide the majority of laughs. These are seasoned comedians who work well freelancing in a script's parameters. I'm assuming that the funnier group scenes were improvised. Rapper Fat Joe deserves a nod as well. He co-stars as Bobby, a prisoner who's taking the class online. Night School would have been vastly more entertaining if the focus were on Teddy's classmates. Night School has an important message about diagnosing learning disabilities. Teddy, who has been branded as dumb his entire life, suffers from a wide range of learning disorders. His dyslexia is shown to the audience from the start. Visual effects are used to illustrate how Teddy sees jumbled numbers and words. From Universal Pictures, Night School lauds the dedicated teachers who help students like Teddy get an education. It does so inartfully, but deserves a modicum of credit for trying.